Year 2 came to an end with our first trip to Scandinavia. A couple months ago, we booked a trip to Oslo and the Fjords region along the western coast of Norway. 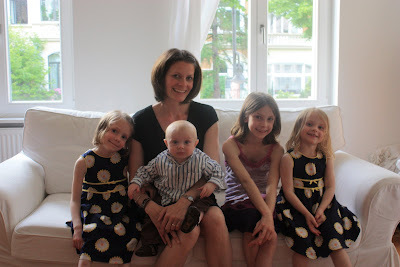 A long holiday weekend here in Germany afforded us a brief window to take a rapid fire trip without holding the girls out of school for more than a day. Thursday, we flew out and by early evening we were strolling the streets of downtown Oslo. The main pedestrian walking street in Oslo is along Karl Johans Gate. It is capped by the main train station from which our hotel was located on one end and the Det Kongelige Slottet (Royal Palace) at the other. With darkness not falling until 10:30 or 11:00pm each night there are opportunities to take advantage of long days. Another reality to get used to in Scandinavia is the scandalous prices ($55 for a large pizza, some chips, garlic bread and some water). The sticker shock is offset by brilliant scenery and sights that are truly unique to the rest of Europe. Our stroll through Oslo the first evening was a pleasant way to get acquainted with the city as we geared up for a big day Friday. Friday’s priority was to visit the outdoor museums and exhibits located on the Bygdøynes peninsula. From the city center the Bydøynes area is best accessed by a short ride on the ferry. Our first stop was the Norsk Folkemuseum. The highlights were the Gol Stave Church made of beautiful timber (from 1200’s) and the Setesdaltunet (buildings/farm houses from the Setesdal region in southern Norway dating from the 17th and 18th century). From there we visited the Vikingskipshuset (Viking ship) and the Kon-Tiki Museet. The first is a small museum that contain three Viking ships that where built in the 9th century. The later houses the balsa wood raft and reed boat that Thor Heyerdahl used to sail across the Pacific and Atlantic oceans to demonstrate the abilities for past civilizations to travel and colonization across the world. We were greeted by a steady rainfall as we ferried back to the main harbor. Seeking shelter we visited the Rådhuset (City Hall) where the Nobel Peace Prize is presented every December. As the rain started to subside, we walked around and caught dinner at Aker Brygge – a shopping area along the Oslo harbor area. To close out the day, we visited the Vigelandsparken. It is an impressive park filled with 212 sculptures by Gustav Vigeland. On Saturday morning, after a nice breakfast at the hotel, we ventured off for an adventure to the Fjords. 5 hours on the train to the small station in Myrdal, and then a dramatic descent nearly a thousand meters landed us at the base of the Sognefjord. One of the most significant sites along the journey was the area around Finse. With an amazing amount of snow and barren landscape, this area seemed popular with locals looking for a late season cross country ski excursion. The descent from Myrdal to Flåm was made on the famous Flåmsbana train. After a long day of train travel, we let the kids play and took a walk through the hills around the Fjord. The brilliant scenery was something to behold. With a boat trip through Fjord from Flåm to Bergen scheduled for later in the afternoon on Sunday, we had the day to explore the area. We chose to walk/hike to the Ostenes farm houses nestled in the mountains. The trip to Bergen on the boat from Flåm to Bergen provided for some fantastic views. We essentially had little time to see much of Bergen as we simply strolled from the docks to the train station to catch our night train back to Oslo. The kids were cooked and ready to rest. The 7 ½ hour ride went quickly as we slept the entire way. The girls weren’t terribly excited about waking up and getting off the train at 6:30am, but we managed. Our remaining hours were highlighted by a trip up to the Holmenkollen ski jump overlooking the Oslo Fjord valley. The jump itself is undergoing a dramatic reconstruction, but the views from the sight were a fitting end to the weekend. Bailey had a much deserved play date with three of her friends on Monday since she has been asking for it for many months. Her friends Heidi, Seyoung, and Wagma came to play. It was great because they entertained Avery and Bryn as well. Yes, that is Lleyton standing up in his crib. So, I spent some time readjusting the crib so the mattress was lower. I feel really lucky that he didn't tumble out of the crib before I came in. 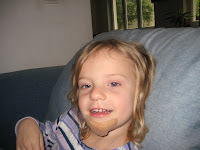 The second thing that happened this week was Thursday morning when Bryn was getting dressed, she started running up the stairs, fell, and cut her chin badly. There was so much blood. But, we contained it pretty quickly. I called the Doctor right away and luckily got her in that morning. They were afraid to do stitches because it was so swollen so they just tried to squeeze the cut together and put steri-strips on the cut. I just think she is in for a pretty good scar. All that, and Lleyton started crawling pretty well, which meant I had to be on my A-game knowing where he was every second. Saturday, Greg had to conduct a Baptism at our Church, and right after that, Bailey, Avery, and I went to the International Charity Fashion Show (which some of the girls' friends were in). It was very fun and the girls got all fancied up for the show (hair, nails, make-up, the works). Also, Lleyton turned 8 months old so Greg took him outside and tried to snap some cute shots of him in the garten (back yard). Sunday, I had to conduct RS again but at least I didn't have to do it alone this time. After Church, my German teacher had his annual picnic for all of his students. It was really fun. Of course Greg got a shot of me eating again. The week was pretty darn basic. However, the weekend was incredibly busy. Saturday, we needed to go to the market first thing in the morning to grab a few things (after Greg made imported blueberry muffins though). We had about a hour and a half until we had to drop Avery off at a birthday party. Then, we were on our way up to Köln to meet a friend of ours from Ann Arbor Ward at home. We spent a little while with Brad at the Dom. We could only spend about an hour and a half with him before we had to drive back and pick Avery up from her party. Then we went to some other friends for dinner (the Millers). We just have the most fun with the Millers, and our kids love to play with their kids. It is always a win-win. Sunday at Church, I had to conduct RS which I have done before but this time I had to do it all by myself auf Deutsch of course. So, I was a bit nervous. It turned out okay I think. For the first few minutes though, the person teaching the lesson was not there, so I was sweating bullets until somebody told me she was out in the hall. Phew! I was thinking, I can handle conducting in German but to wing an unprepared lesson in German, that may be overstepping my capabilities just a bit. Thankfully the teacher was there. We came home, had a great dinner (Chicken Marsala) one of my favorites and awesome brownie sundaes. Thanks for the Sanders hot fudge, mom! 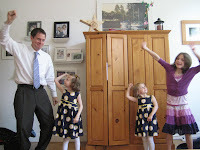 Then, the girls put on a presentation for me with singing and dancing. 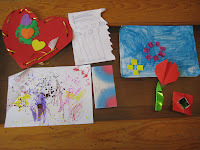 And, of course gave me the presents they had been working hard on all week. We took our annual Mother's Day picture which actually turned out pretty good this year. It was a great weekend. I am so blessed. Y2W49 - Rheinaue, Bonn, Rhein...and Swine Flu? The week started out normal enough although Lleyton and I seemed a bit under the weather with a cold. On Wednesday, I had signed up to drive for Avery's field trip. She begged me and gave me the, "You never go on field trips with me" plea. I of course gave in and pretty much decided that whatever it took I would go on the field trip to Knauber with Avery's whole class (22 students) to pick out a gerbil or two. Lleyton threw up twice during the night so I thought I would have to cancel on her. But, he seemed a bit better in the morning. We took extra blankets just in case. We went on the field trip and everything worked out fine. However, Lleyton got worse and worse the rest of the week. I probably would have thought nothing of it until I heard that everybody and their brother had no school in the US because of this Swine Flu epidemic. Friday was a holiday which was great and the weather was really nice, but that means I had to take Lleyton to the hospital instead of just going to the Pediatrician. Let's just say that I was a little fired up about the way the cue was working. After two hours of waiting, they saw him for about five minutes or less. It was just a virus they said and gave us some eye drops and nose drops. I asked if they wanted to take a blood test just in case we had somehow been exposed to the Swine Flu, after all we did have a visitor from the US the week before. They assured me it was nothing to worry about. In my head I was thinking, "Don't you just want to take a blood test just to be safe?" It appears we have both recovered so I guess I was worrying for nothing.